"And to them it was given that they should not kill them, but that they should be tormented five months: and their torment was as the torment of a scorpion, when he striketh a man. And in those days shall men seek death, and shall not find it; and shall desire to die, and death shall flee from them." "The shapes of the locusts were like unto horses prepared unto battle; and on their heads were as it were crowns like gold, and their faces were as the faces of men. And they had hair as the hair of women, and their teeth were as the teeth of lions. And they had breastplates, as it were breastplates of iron; and the sound of their wings was as the sound of chariots of many horses running to battle. And they had tails like unto scorpions, and there were stings in their tails: and their power was to hurt men five months. And they had a king over them, which is the angel of the bottomless pit, whose name in the Hebrew tongue is Abaddon, but in the Greek tongue hath his name Apollyon." The Lord reassures His people (those with "the seal of God in their foreheads") that He will protect them from the torment of these locust-like creatures which will come upon the earth in the last days. Drones will eventually be equipped with stronger chemical weapons and able to make their own decisions, according to a new report from the U.S. Department of Defense. In a 25-year roadmap for unmanned vehicles, the DoD revealed it hopes to increase drone capabilities in order to save money and better protect the nation’s skies. Currently, drones require extensive manpower on the ground in order to fly and follow precise commands. But in order to cut down on the expense of pilots, the DoD plans to build autonomous drones able to deviate from given missions to pursue a better target, by following a certain set of “laws” delineated by algorithms and advanced sensors. Drones will also be able to hunt in “swarms” launched from an unmanned “mothership.” These so-called kamikaze drones will be programmed to crash into targets. Other drones will be equipped with even more deadly chemical weapons. A recently demonstrated breakthrough in technology may help Unmanned Aerial Systems (UAS), better known as drones, stay airborne for very long periods of time before having to return to Earth. The next generation of military robots is set to be based on designs inspired by the insect world. The dragonfly drones and cyborg moths, with in-built micro-cameras, could revolutionise spying missions and rescue operations. The advantage of using drones is that they can be used in emergency situations too dangerous for people and in secret military surveillance raids. And new research suggests that the mechanics of insects can be reverse-engineered to design midget machines to scout battlefields and search for victims trapped in rubble. 'Nature has solved the problem of how to design miniature flying machines. The insect manoeuvrability, which allows flies the ability to land precisely and fly off again at speed, may one day save lives in wars and disasters. 'Scary spider robots were featured in Michael Crichton's 1980s film Runaway -- but our robots will be much more scaled down and look more like the quidditch ball in the Harry Potter films, because of its ability to hover and flutter. 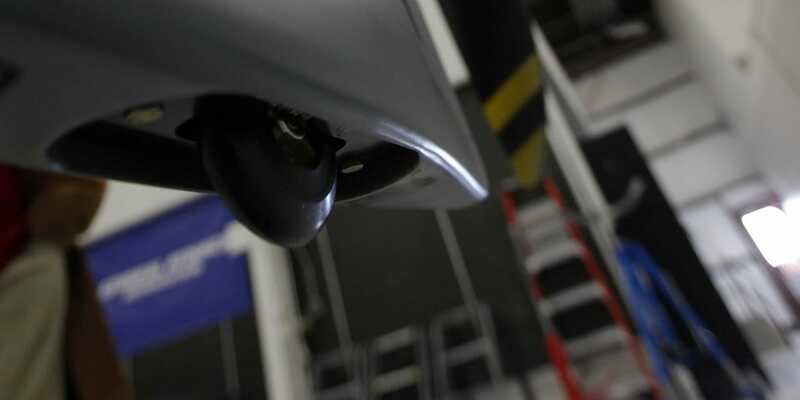 Currently, the smallest of state-of-the-art fixed-wing unmanned surveillance vehicles are around a foot wide. The incorporation of flapping wings is the secret to making the new designs so small. To achieve flight, any object requires a combination of thrust and lift. In manmade aircraft, two separate devices -- engines and wings -- are needed to generate these, but this limits the scope for miniaturising flying machines. An insect's flapping wings combine both thrust and lift. If man-made vehicles could emulate this more efficient approach, it would be possible to scale down flying machines to much smaller dimensions than is currently possible. The team's groundbreaking work has attracted the attention of NATO, the US Air Force and the European Office of Aerospace Research and Development. 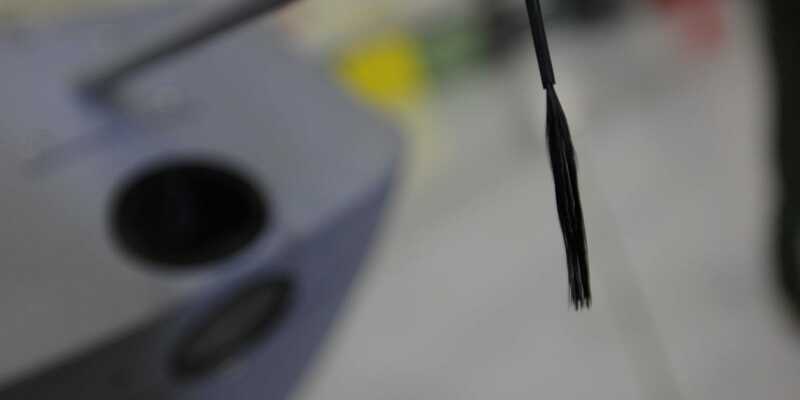 The research is expected to produce findings that can be used by the defence industry within three to five years, leading to the development and widespread deployment of insect-sized flying machines in the next two decades. Nature has perfected something that us humans simply stumbled upon. In doing research and development of drones, engineers were struggling with one major problem: how to make drones be able to dodge and fly around objects, move with extreme agility, and navigate the elements that Mother Nature produces. Well, Mother Nature herself had the answer to their problems. Engineers soon realized that she had perfected flight, in the form of insects, which were ‘engineered’ vastly different than what man had produced thus far: they had flapping wings, whereas man had always made it’s flight possible with ‘fixed-wing’ aircraft. Engineers have began producing tiny drones that mimic the biological technology that pesky insects exhibit on a daily basis. They designed drones that were just like insects…thus…the Microdrone. Mother Nature has had this technology available for millions of years. We have merely discovered it’s existence. “The robots you know tomorrow are going to look like nothing you know today. More likely, they will look like the animals around you..” says Peter Singer of the Brookings Institute. The Microdrones can fly, bump into things, recover, and keep flying. This is one of the first ones developed by researchers at Harvard University. 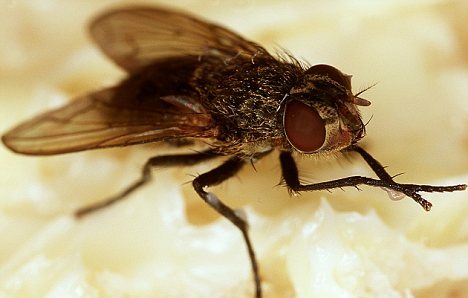 Most of them have shock absorbers that are designed from the bodies of house flies. Some of these robotic insects could perform humanitarian efforts, such as searching disaster areas for survivors. Some could have agricultural benefits, such as pollination that real bees usually do. Others could monitor traffic, or be used for environmental research. According to various internet sources, a team of researchers at the Johns Hopkins University in conjunction with the US Air Force Office of Scientific Research at Wright-Patterson Air Force Base in Arlington, Virginia, is helping develop what they are calling a micro aerial vehicle (MAV) that will undertake various espionage tasks. But getting from bird size to bug size is not a simple matter of making everything smaller. "You can't make a conventional robot of metal and ball bearings and just shrink the design down," said Ronald Fearing, a roboticist at the University of California at Berkeley. For one thing, the rules of aerodynamics change at very tiny scales and require wings that flap in precise ways -- a huge engineering challenge. Only recently have scientists come to understand how insects fly -- a biomechanical feat that, despite the evidence before scientists' eyes, was for decades deemed "theoretically impossible." Just last month, researchers at Cornell University published a physics paper clarifying how dragonflies adjust the relative motions of their front and rear wings to save energy while hovering. That kind of finding is important to roboticists because flapping fliers tend to be energy hogs, and batteries are heavy. The CIA was among the earliest to tackle the problem. The "insectothopter," developed by the agency's Office of Research and Development 30 years ago, looked just like a dragonfly and contained a tiny gasoline engine to make the four wings flap. It flew but was ultimately declared a failure because it could not handle crosswinds. Agency spokesman George Little said he could not talk about what the CIA may have done since then. The Office of the Director of National Intelligence, the Department of Homeland Security and the Secret Service also declined to discuss the topic. Only the FBI offered a declarative denial. "We don't have anything like that," a spokesman said. In one approach, researchers funded by the Defense Advanced Research Projects Agency (DARPA) are inserting computer chips into moth pupae -- the intermediate stage between a caterpillar and a flying adult -- and hatching them into healthy "cyborg moths." The Hybrid Insect Micro-Electro-Mechanical Systems project aims to create literal shutterbugs -- camera-toting insects whose nerves have grown into their internal silicon chip so that wranglers can control their activities. DARPA researchers are also raising cyborg beetles with power for various instruments to be generated by their muscles. "You might recall that Gandalf the friendly wizard in the recent classic 'Lord of the Rings' used a moth to call in air support," DARPA program manager Amit Lal said at a symposium in August. Today, he said, "this science fiction vision is within the realm of reality." A DARPA spokeswoman denied a reporter's request to interview Lal or others on the project. "I'll be seriously dead before that program deploys," said vice admiral Joe Dyer, former commander of the Naval Air Systems Command, now at iRobot in Burlington, Mass., which makes household and military robots. Researchers at the California Institute of Technology have made a "microbat ornithopter" that flies freely and fits in the palm of one's hand. A Vanderbilt University team has made a similar device. With their sail-like wings, neither of those would be mistaken for insects. In July, however, a Harvard University team got a truly fly-like robot airborne, its synthetic wings buzzing at 120 beats per second. "It showed that we can manufacture the articulated, high-speed structures that you need to re-create the complex wing motions that insects produce," said team leader Robert Wood. The fly's vanishingly thin materials were machined with lasers, then folded into three-dimensional form "like a micro-origami," he said. Alternating electric fields make the wings flap. The whole thing weighs just 65 milligrams, or a little more than the plastic head of a push pin. Still, it can fly only while attached to a threadlike tether that supplies power, evidence that significant hurdles remain. In August, at the International Symposium on Flying Insects and Robots, held in Switzerland, Japanese researchers introduced radio-controlled fliers with four-inch wingspans that resemble hawk moths. Those who watch them fly, its creator wrote in the program, "feel something of 'living souls.' "
Others, taking a tip from the CIA, are making fliers that run on chemical fuels instead of batteries. The "entomopter," in early stages of development at the Georgia Institute of Technology and resembling a toy plane more than a bug, converts liquid fuel into a hot gas, which powers four flapping wings and ancillary equipment. "You can get more energy out of a drop of gasoline than out of a battery the size of a drop of gasoline," said team leader Robert Michelson. Even if the technical hurdles are overcome, insect-size fliers will always be risky investments. "They can get eaten by a bird, they can get caught in a spider web," said Fearing of Berkeley. "No matter how smart you are -- you can put a Pentium in there -- if a bird comes at you at 30 miles per hour there's nothing you can do about it." Protesters might even nab one with a net -- one of many reasons why Ehrhard, the former Air Force colonel, and other experts said they doubted that the hovering bugs spotted in Washington were spies. So what was seen by Crane, Alarcon and a handful of others at the D.C. march -- and as far back as 2004, during the Republican National Convention in New York, when one observant but perhaps paranoid peace-march participant described on the Web "a jet-black dragonfly hovering about 10 feet off the ground, precisely in the middle of 7th avenue . . . watching us"? They probably saw dragonflies, said Jerry Louton, an entomologist at the National Museum of Natural History. Washington is home to some large, spectacularly adorned dragonflies that "can knock your socks off," he said. At the same time, he added, some details do not make sense. Three people at the D.C. event independently described a row of spheres, the size of small berries, attached along the tails of the big dragonflies -- an accoutrement that Louton could not explain. And all reported seeing at least three maneuvering in unison. Mara Verheyden-Hilliard of the Partnership for Civil Justice said her group is investigating witness reports and has filed Freedom of Information Act requests with several federal agencies. If such devices are being used to spy on political activists, she said, "it would be a significant violation of people's civil rights." For many roboticists still struggling to get off the ground, however, that concern -- and their technology's potential role -- seems superfluous. "I don't want people to get paranoid, but what can I say?" Fearing said. "Cellphone cameras are already everywhere. It's not that much different." As some of my regular readers may already know, I have been a follower of developments within the fields of robotics and nanotechnology for a number of years now. Not only do I find these topics interesting, but I believe that it is important that we have a grasp of where these fields are heading, as they may possibly help us to better understand some of the rather cryptic visions which are found in the Apocalypse, or the Book of Revelation, as it is commonly known. For example, in chapter nine, after the fifth Angel has blown his trumpet, we find the following intriguing Scriptures which describe the deadly locusts which ascend out of the Bottomless Pit, led by the demonic leader known as Abbadon, (or Apollyon in Greek); which literally means the Destroyer:"
A locust, particularly that species which especially infests oriental countries, stripping fields and trees. Numberless swarms of them almost every spring are carried by the wind from Arabia into Palestine, and having devastated that country, migrate to regions farther north, until they perish by falling into the sea. The Orientals accustomed to feed upon locusts, either raw or roasted and seasoned with salt (or prepared in other ways), and the Israelites also were permitted to eat them." I honestly don't know what John saw. However, according to information I read years ago, some writers have suggested that these "locusts" may represent fighter helicopters of one kind or another, which are used by national militaries all over the world. The sound that John describes might very well be attributed to the helicopter's engines. The "hair of women" might possibly be a reference to the fast-spinning propellers. The "faces of men" could possibly be a reference to seeing soldiers through the transparent windshield on the front of the craft. The "teeth of lions" might be referring to "teeth" painted on the front sides of the helicopters in order to make them look more fierce. As you'll already know, it is a common practice of war pilots to do this in order to scare their enemies. Last of all, the sting in their tails might be referring to the ability of helicopters to shoot missiles from their tail sections. Again, I really can't say what John saw. One speculation that I read a number of years ago suggests that John may have seen a battlefield full of army tanks. Tanks shooting artillery shells would certainly fit John's description of these horses shooting fire, smoke and brimstone from their mouths. As far as their tails being like serpents with heads that hurt, the picture I am given is of a poisonous snake striking out at something which it perceives as a threat, and then recoiling. If we think about how when fired, an artillery gun on some of these tanks will sort of spring forward momentarily, and then draw back again, it makes perfect sense to describe them as serpent heads. Taking into consideration these explanations, theories that they may be, does suggest then that some of the things that John saw in his visions may have actually been war machines of the future, and not real locusts or horses. But the real question is, how far into the future? In the previous verses, according to Thayer's Greek lexicon, the word "image" is derived from the Greek word "eikon". It means "image, figure, likeness". It's from this word that we also get our English word "icon". In other words, the False Prophet will encourage the world to make a statue bearing a resemblance to the Beast. But how can a statue possibly be made to speak? In John's day, such a feat would have been impossible; but today, given our technology, the answer is as simple as using a speaker; or it could possibly be that, as I have suggested before, the phrase "Image of the Beast" is referring to a computerized image of the Beast, such as on a huge monitor; or it might even be some kind of robotic entity. To John, seeing a futuristic-looking robot suddenly move or speak, would indeed seem like a statue coming to life by some unseen spiritual power. What actually inspired me to write this commentary was some news articles I have been reading in the New York Times over the last several years, regarding the US military's efforts to create robotic vehicles which it plans to use in its wars of the next decade. At this current time, as you may know, the American government has already been deploying drones in foreign countries. These pilot-less vehicles are used, among other things, to map terrain, to spy on the activities of perceived enemies, and even to fire missiles on selected targets with deadly precision. In order to pool ideas, and speed up the development of its battle machines of the future, during the last three years or so, a special US Government agency known as DARPA, which is an acronym for Defense Advanced Research Projects Agency, has been sponsoring a robot race that has drawn participants from major corporations and universities all across America. These include Stanford, MIT, Carnegie Mellon, Virginia Tech, and other prestigious institutions. While the race, currently called the "Darpa Urban Challenge", is a lot of fun for the participants, we should not lose sight of the fact that the primary goal of these races is to help the Pentagon to build its next generation of war machines. In fact, it should be noted that this year's race was held at a former Air Force base located in Victorville, California, according to the New York Times. Of course, these universities aren't just participating in the DARPA races because they are a lot of fun, or even just because they are American patriots. There is a lot of money involved. This year's race involved navigating a sixty-mile course through a simulated urban environment; and the robotic vehicles had to accomplish this task in less than six hours, in order to qualify for one of the three prizes, which were two million dollars, one million dollars, and five hundred thousand dollars. There were eleven entrants in the "Darpa Urban Challenge", and the grand prize went to a vehicle designated as "Boss", which was designed by noted roboticist William L. Whittaker and his team at Carnegie Mellon University. According to the information I have read, Professor Whittaker was one of the original individuals to propose using these kinds of vehicle races as a means to advance robotics. Since earning his B.A. and Ph.D. at Carnegie Mellon University in the mid-70's, he has been deeply involved in the field of robotics. In fact, in the same year that he received his Ph.D., the infamous Three Mile Island nuclear accident occurred, and Whittaker and his team constructed robots to inspect and repair the damage which had occurred in the reactor's basement. Later, in 1986, Whittaker would perform a similar function when the Chernobyl nuclear disaster occurred in Ukraine. In addition to his experience with nuclear reactor meltdowns, beginning in the late 1990's Professor Whittaker and his team designed and created a robot called Nomad the meteorobot; the purpose of which was to search for fallen meteorites in the glacial ice fields of Antarctica. This project was funded by a $5 million dollar grant from NASA's Telerobotics Research Program in the Space Science Office. Furthermore, the project was a prelude to sending exploratory robots to the Moon, as well as to Jupiter's frozen moon, Europa, and also to the red planet, Mars. Furthermore, Whittaker has been involved in projects which have sent robotic vehicles into the craters of active volcanoes, and also into collapsed mine shafts. While there are obviously some ways in which these races can benefit society as whole, such as by leading to the eventual production of regular vehicles which will be safer for the general public, nevertheless, as I read these news articles regarding the DARPA project, it occurred to me how dangerous these developments can be as well; and I will now explain to you why I feel this way. As I have pointed out in earlier articles, modern technology can be very beneficial for humanity in many different ways. Through a plethora of modern inventions, no one can deny that our lives have become so much easier. As a result of modern medicine, lives have been prolonged, and the suffering of a lot of people has also been eased. However, just as there is potential for a lot of good to be derived from this modern technology, there is likewise potential for evil being done as a result of it as well. It depends on who has access to the technology, what their motives are, and how they intend to use it. On one hand, well-meaning scientists may create prosthetic limbs or an artificial heart, while on the other, they also invent nuclear, biological and chemical weapons. To understand how evil this is, stop and consider how much of the world is opposed to America's illegal, ill-conceived war in Iraq. As a direct result of George W. Bush's foolish invasion of that sovereign nation, literally millions of people's lives in Iraq have been negatively affected. Iraq's government, as well as its military forces, was shattered. Social order was destroyed. Iraq's economy was obliterated. Its infrastructure was in large part destroyed, and basic social services came to a standstill. Furthermore, as the mass media has revealed, millions of people have been displaced; thousands of people have died, or been physically or psychologically crippled needlessly, and poverty, sickness, starvation and misery have become more widespread. But in America, as past wars have shown, what makes a war unpopular, is when the body bags begin to come home, or when soldiers arrive home horribly disfigured, missing limbs, or psychologically messed up. If the numbers rise to high, that is when the American public begins to say "Enough is enough". This is precisely what occurred during the Viet Nam war era, and this is what is happening now with the Iraq war. As a result, next to the economy, the war in Iraq has become one of the most important issues to American voters as the 2008 presidential election approaches. In spite of the fact that President Bush has done everything in his power to keep the full truth from the American people regarding how many American dead and injured there have been, enough of the truth has leaked out, to where a large portion of the American population are now sick of the war, sick of Bush's lies and deception, and they want American forces out of Iraq. What was supposed to be a war that would last a few weeks, or a few months at the longest, has now turned into almost a five-year war, and Bush and his cronies insist that America needs to remain there even longer, years in fact. "We've been looking at the problem of protecting people on the battlefield". Exactly what did Whitaker mean by that? Well, what better way would there be to protect American soldiers on a foreign battlefield, than by not having to use real people at all, or at least very few of them? This is not as far-fetched an idea as you may think; and all indications are that this is precisely the ultimate goal of those who deal with these things. Last year I had the opportunity to view a short-lived sci-fi television show called "Masters Of Science Fiction". One of the four episodes was called "Jerry Was A Man". It turns out that Jerry was an android designed, like his fellow androids, to clear mines in a battlefield. Sometimes the robots would take the wrong step and would be blown up. Jerry, however, was different. In a particular test, he clearly demonstrated the will for self-preservation when he purposely bumped into another android, which subsequently stepped on a mine, and was blown up. The reason why I find this story interesting, is because, as we have seen through other examples of modern technology, our science fiction is slowly catching up with us. What does this say about our future, and the future of human warfare? That is precisely what could happen in the not-too-distant future, if an American president, or any world leader for that matter, could fight a war primarily using intelligent robotic machines. The high-flying drones that are now in use are just the beginning, and the tip of the ice berg, of what terrible wars could lie in the world's near future. Can you perceive the danger of such a scenario? As a result of this kind of advanced technology, an American president, or any world leader, could wage a secret, endless war against his enemies, and not be held accountable for it, because there would be very few, if any, body bags coming home from the war front. Many Americans have become so callous, that as long as there are no American casualties, and as long as the economy is doing well, they would probably offer very little protest. It is a well-established historical fact that the U.S.A. was founded upon war. America, and its economy, have survived to this day, as a result of being almost in a constant state of war, somewhere in the world. The U.S.A. has repeatedly used war, or at least the threat of war, as a means to spread its imperialistic empire around the world. The America government has repeatedly used war to punish its perceived enemies, and to force "belligerent" nations into submission to the will, and foreign policy objectives of the war hawks in Washington D.C. Given America's clear history over the past two hundred plus years, it can be honestly said that the American people are really a war-prone people. While they claim to be a peaceful nation, the record reveals that the USA has resorted to war in order to achieve its objectives, more than any other major world power during the last seventy years. Whenever Americans have hesitated to engage in a war, the president, along with his propaganda agent, the mass media, has always found a way to convince them that waging war is in their best interest. The war, so he claims, will make them a lot safer, and it will protect the comfortable American way of life, which no American is about to give up, for any price. The prevailing attitude seems to be that it is far better to make the other fellow, in some other country, pay the price for Americans' luxury and wasteful lifestyle. Thus, through a constant barrage of slick propaganda, Americans are lulled back to sleep, and the war, legitimate or not, is waged by their Commander-In-Chief. While I have highlighted America's war sins, it should be noted, of course, that the American president is not the only world leader who engages in such subtle tactics. All world leaders, when embarking on the war path, have to first convince their constituents, that a war is a just and necessary cause, even if it is a distasteful one; and like the American president, they too will promote patriotism, and will spin whatever lies are necessary, in order to convert the populace to their way of thinking. As I pointed out earlier, if robotic vehicles and automated fighter machines are used in future wars, it means that the human casualty rate on the American side will be very low, if not totally nonexistent. As a result, lethargic American society will have nothing to complain about, and a president could potentially wage a war for years, without ever taking any negative heat for it. As long as the economy is strong, and the public continues to enjoy their materialistic life- style, everyone is happy; except, of course, for the people in the targeted country, whose lives are being destroyed by America's merciless, "shock-and-awe" wars. At this current time, the general consensus within the realm of science is that computers will become as smart as, or even smarter than human beings, around the middle of this century. Is it conceivably possible that SkyNet will begin to evolve? While that is indeed a scary thought, I don't think that it's going to come to that. My reason for stating this is simple. What the previous verses seem to indicate, is that while the wars of the future may involve a lot of automated technology, apparently, at the time that the Battle of Armageddon occurs, there are still going to be a lot of human beings engaging in warfare; although they may be enhanced human beings; that is to say, what are referred to as "super soldiers". These rebellious souls will be devoured by the fowls, so they are obviously not robot fighting machines. So exactly what will be the cause of this Great Tribulation, such as the world has never seen before? Will it just be the armies of the Beast and the False Prophet waging war against the people of God, and the nations of the world? Will we be facing complete annihilation due to multiple nuclear wars? Will it be the result of the many earthquakes, famine, and disease which will plague the world? Or is it possible that the "Rise Of The Machines" will begin to become a reality, and Christ will have to put a stop to it, lest there is no one left alive? Please notice that Jesus clearly states that if it weren't for the fact that He is coming back, and thus shortening the days of this time of great trouble, no flesh would be saved; in other words, no one would be left alive. That, my friends, means complete and total annihilation. Or does it infer extermination by a superior evil force? Exactly how Jesus will save us out of this world is another interesting question I pondered some time ago. If you would like to know what I think, you may want to consider reading the intriguing series called "Chariots Of Fire: A Voluntary Voyage To Heaven?". It is rather challenging; particularly for conservative-minded Christians. You may marvel at the creations of the writers of science fiction, but your mind will be blown when you discover what God may have. Even the crew of the Starship Enterprise would be jealous. In conclusion, John and Sarah Connor may be cool in the world of science fiction, but I'd rather put my trust in Jesus any day. How about you? With these words, I'm going to bring this article to a close. I pray that it has been a blessing to many. Dubbed the "Switchblade," the robotic aircraft represents the latest attempt by the United States to refine how it takes out suspected militants. Weighing less than two kilos, the drone is small enough to fit into a soldier's backpack and is launched from a tube, with wings quickly folding out as it soars into the air, according to manufacturer AeroVironment. "Upon confirming the target using the live video feed, the operator then sends a command to the air vehicle to arm it and lock its trajectory onto the target," it said. The drone then flies into the "target," detonating a small explosive. The California-based firm also said the drone can be called off at the last moment, even after a kill mission has been ordered. That feature provides troops with "a level of control not available in other weapon systems," it said. In the war in Afghanistan, US and coalition troops fighting the the Taliban can call in artillery fire or air strikes from fighter jets and attack helicopters. But the heavy firepower has been blamed by Afghan leaders for claiming the lives of innocent civilians and strained US relations with Kabul. "Flying quietly at high speed the Switchblade delivers its onboard explosive payload with precision while minimizing collateral damage," the company said. The U.S. Air Force...launched (an) urgent procurement program for lethal mini-drones, aiming to field such weapons with Special Operations command units in 2012. The weapons to be delivered...will offer the warfighter a portable, non-line-of-sight precision strike capability against individual stationary or moving individuals, ensuring high precision effect from covert positions, with a very low risk of collateral damage. In December 2010 the air force selected three contractors to provide provide weaponized systems for a test series, planned for April 2011. The companies are Aerovironment, IAT and Textron Defense Systems. The Air Force plans to begin procurement of such weapons as early as 2012. Two representative systems in this category are a new ‘Point and Toss’ mini-drone from IAT and the Switchblade developed by Aerovironment, presumably under ‘Project Anubis‘. The Air Force expects the new weapon to weigh around 3 lbs (1.36 kg). The user will also carry the integrated operating console and communications unit, weighing additional 3 pounds. The entire system could deploy and be ready to fire within 30 seconds. Once launched, the system should be capable to acquire a man-size target at the system’s combat range, in less than 20 seconds, flying at an altitude of 100 meter above ground. If conditions for attack are not met, the MAV will be able to loiter over the target for up to 30 minutes. For the terminal phase, the MAV is designed to hit target within 3.28 ft (1 meter) radius, at maximum speed of 80 – 100 mph (35-44m/sec). This accuracy matches the warhead’s effectiveness to kill or incapacitate personnel in the open or on soft skinned vehicles, within a two meter radius from the point of detonation. The Switchblade is designed to provide the warfighter with a “magic bullet”. It can rapidly provide a powerful, but expendable miniature flying Intelligence, Surveillance and Reconnaissance...within minutes. This miniature, remotely-piloted or autonomous platform can either glide or propel itself via quiet electric propulsion, providing real-time GPS coordinates and video for information gathering, targeting, or feature/object recognition. The vehicle’s small size and quiet motor make it difficult to detect, recognize, and track even at very close range. The Switchblade is fully scalable and can be launched from a variety of air and ground platforms. The idea of small, man portable, soldier-launched aerial drones has been catching on for some time now with military operations commanders, as they bring the unique situational awareness and reconnaissance capabilities of larger drone aircraft down to the platoon--or even the individual--level. Now, the U.S. Army is taking the idea to the next level, ordering its first batch of weaponized drones capable of launching from small, portable tube and suicide bombing a target from above. The drone aircraft are made by Aerovironment, the same California company that makes the Nano Hummingbird surveillance drone. Their “Switchblade” drone packs neatly into its launch tube, which then packs easily into a backpack. When it’s time to deploy, soldiers quickly set up the launch tube and send Switchblade skyward, where its wings deploy and its quiet electric engine fires up. From there a pilot can operate the Switchblade remotely, using a video feed from the drone to pilot it and make observations of a potential target. 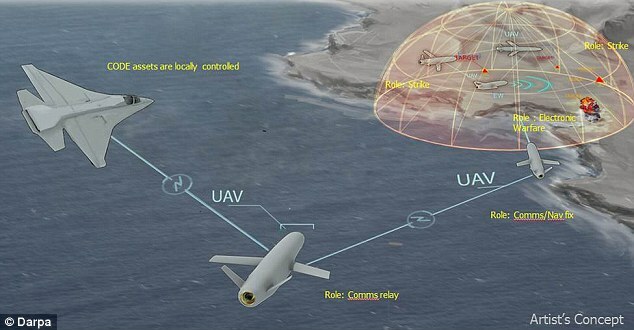 If the target is confirmed, the pilot can arm the on-board munition and fly the drone straight into the target. The drone can fly piloted or autonomously (though naturally it has to receive human commands before arming and attacking). It can even power down its motor and glide in for the kill, offering mission operators a stealthy means of approach. While a weaponized-robotic-aerial-kill-vehicle sounds cool enough on its own, what Switchblade really offers is a capability–it can loiter overhead and observe a situation on the ground, confirm that a target is indeed a legitimate target and not a civilian or some other non-threat, and then deliver a strike without the soldier who deployed the aircraft ever having to stick his head out. Such a capability trumps calling in airstrikes or artillery fire for small targets, and perhaps best of all it’s a capability available at soldier level. On Tuesday, the Air Force issued a call for help making a miniature drone that could covertly drop a mysterious and unspecified tracking “dust” onto people, allowing them to be tracked from a distance. The proposal says its useful for all kinds of random things, from identifying friendly forces and civilians to tracking wildlife. But the motive behind a covert drone tagger likely has less to do with sneaking up on spotted owls and more to do with painting a target on the backs of tomorrow’s terrorists. Effectively tracking foes has become a high priority — and deeply secret — research effort for the Pentagon, which has struggled at times to sort out insurgent from innocent in places like Afghanistan. The Navy has a $450 million contract with Herndon, Virginia’s Blackbird Technologies, Inc. to produce tiny beacons to make terrorists trackable. The Defense Department has been pouring serious cash — $210 million that they’ll admit to — to find advanced new ways to do this so-called “Tagging, Tracking and Locating” work, as Danger Room co-founder Sharon Weinberger noted in Popular Science last year. The research she cataloged is as mind-boggling as it is varied. Ideas range from uniquely-identifiable insect pheromones to infrared gear that tracks people with their “thermal fingerprint.” One company, Voxtel, makes tiny nanocrystals that can be hidden in clear liquids and seen through night vision goggles. A 2007 briefing from U.S. Special Operations Command on targeting technology stated that SOCOM was looking for “perfumes” and “stains” that would mark out bad guys from a distance. The presentation listed a “bioreactive taggant” as a “current capability” next to a picture of what looks like a painted or bruised arm. Another tracking technology is “smart dust” — a long-forecast cloud of tiny sensors that stick to target human or his clothes. And that seems to be what the Air Force wants its mini drone configured for. The solicitation floats the idea of dropping a “dust-like” cloud of electromagnetic signal-radiating taggants, either on top of the target or in his path so that he’ll walk into it. To do that, they’d need to either do some high-altitude “crop-dusting” of the target or launch a small munition that would blow out the taggant in mid-air when it was nearby. It may be a signal that the smart-dust technology is at least feasible enough to plan a vehicle around. In her article, Weinberger notes that Darpa-funded researchers had drones that could drop clouds of taggants the size of a grain of rice as early as 2001. It’s hard to say for certain, but accounts of drone targeting tech from Taliban and al-Qaida leaders indicate that the current tracking beacons — which rely on radio frequency pulses, radar or infrared flashes — pale in comparison to some of the proposals. According to statements from a Pakistani Taliban commander, the U.S. gives local spies tracking “chips” in their cell phones in order to train Hellfire missiles on militants. The battery-powered infrared beacons that al-Qaida says it found spies using, are a well-known technology that dates back to at least 1984. What form will the Air Force’s dusting drone take? The Air Force states the design isn’t set in stone — they’re open to “other innovative methods” — so it’s as-yet unformed. But the “References” section of the solicitation name-checks a 1997 study for Darpa, “Small Scale Propulsion: Fly on the Wall, Cockroach in the Corner,” [pdf] which may contain some clues. The study examines the feasibility of Micro Air Vehicles (MAVs) on the battlefield to deliver a payload of taggants or explosives and mentions that while animal-like robots would be great, the technology to replicate their movement isn’t quite available yet. Al-Qaeda might want to keep an eye out for strange birds in the coming years, because one of the companies mentioned in the 1997 study as having promising MAV technology, AeroVironment, has been perfecting a robotic hummingbird that can fly remotely for up to 10 minutes.